Are you a huge fan of classical theater? Which genre do you prefer, tragedy or comedy? Well if you're anything like us, then you're probably a bigger fan of comedies! Not that we don't like the classic tragedies... they can just get really depressing, with all the backstabbing and dieing. However, the comedies are always filled with laughs and usually topped off with a happy ending, to leave you with a smile as you walked out of the theater. 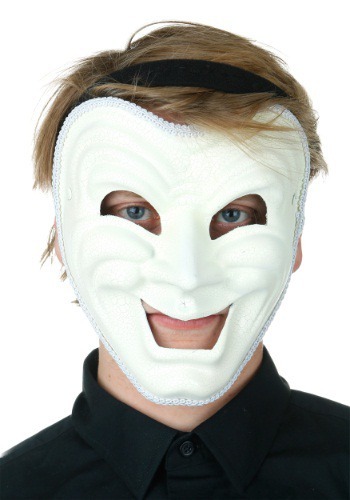 Now, with this Adult White Comedy Mask, you can have that same effect on people. You can be the funny guy at the party and give everyone the gift of laughter! The mask is modeled after the pair of masks you'd see in just about any drama school, one representing tragedy and one comedy (this one is obviously resembling the latter). We recommend you learn a couple jokes and get a strong comedy routine down, none of those knock-knock or jaywalking chicken funnies. Get your A-game ready, because when you're wearing this mask everyone's going to expect some high-quality entertainment. Standard Size 7" x 8" 7" x 8"